London March 30, 2012 – Kodak today announced that Statistics South Africa (Stats SA) is using sixteen high performance i1860 production scanners to process all paperwork associated with the 2011 census in South Africa. 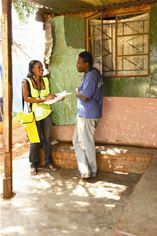 The third official census in South Africa since apartheid ended and democracy started in 1994, the population census was conducted between October 10 and 31, 2011 and involves residents completing a 15 page form containing 75 questions. It is a massive undertaking involving 156,000 temporary workers, covering about 104,000 clusters of delimited areas consisting of 160 dwellings on average. In total around 20 million questionnaires will be returned and scanned. It is expected, therefore, that over 225 million images will be digitised in six months, equating to, on average, 50,000 images per scanner processed per 8 hour shift. Kodak reseller, CSX, based in Sandton, South Africa, was selected as key implementation partner. An official government department of the South African government employing 4,500 staff, in addition to the census carried out every five years, Stats SA is responsible for compiling and providing a range of national statistical information such as economic statistics including inflation rates, GDP, Producer and Consumer Price Index data, along with population and social statistics, for example unemployment and poverty surveys. Official statistics assist the state, businesses, other organisations and the public in planning, decision-making, monitoring and assessment of government policies. Stats SA chose Kodak i1860 scanners for the 2011 census because of their ability to process the vast quantity of paperwork generated. Rated at 200 pages per minute with unlimited daily scanning capacity, the Kodak i1860 production scanners are ideally suited for high volume workload environments. Stats SA has a long history using Kodak imaging technology dating back to 2001 when it first installed its scanners which are still being used and supported today. Census forms are collected from 128 district offices around the country, checked and then sent to a central processing site in Pretoria. Here they are bar coded, separated, scanned and analysed. Stats SA uses eFlow software from Top Image Systems for OCR capability to import data from the census forms into an in-house developed Oracle–based electronic document management system. Staff access this using a web-based front end portal. Given the track record of its high performance scanner, archive writer solutions and service and support, Kodak has been involved in numerous censuses carried out internationally over the past two years including Argentina (2010), Australia (2011), India (2010), with the Bangladeshi census happening this year. As the world’s foremost imaging innovator, Kodak helps consumers, businesses and creative professionals unleash the power of images, information and printing to enrich their lives. Kodak enables customers to capture and use valuable information from electronic and paper documents. Our document imaging solutions include award-winning scanners and capture software, an expanding range of professional services and industry-leading service and support. From small offices to global operations, Kodak has the right solution to feed your business the information it needs. More information about KODAK Document Imaging Scanners, Capture Software and Services is available at http://www.kodak.com/go/docimaging. Follow us on Twitter at twitter.com/kodakdi and visit our blog at growyourbiz.kodak.com.